This was a nice and casual feeling poster run on a warm Saturday in September just as the seasons were beginning to change. The leaves are a beautiful colour here in New Jersey at present and they remind me of the colours of New Zealand’s central Otago when the autumn season is coming along. But then nothing could ever be like central Otago in the way that the light hits those autumnal colours and the sky itself sparkles. The sensation of driving through central Otago on an autumn day will sustain you for months on end. That feeling is what we live for. It is to be on the ground. It is best to be driving a big old Ford V8, that way the light gets in. 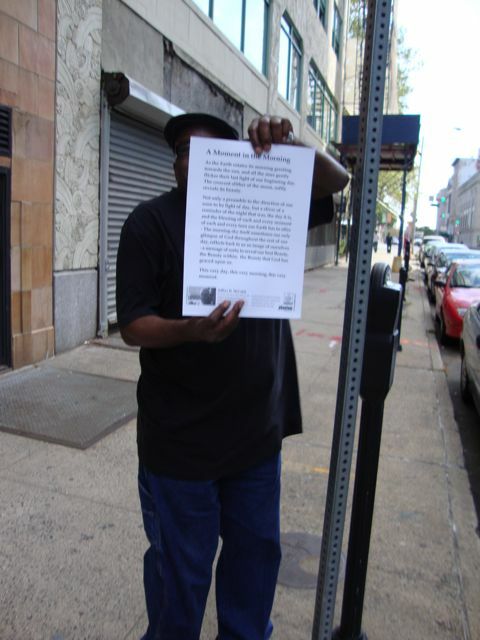 In Newark, I was carrying poem posters by at least seven or eight poets and the majority of them being Kiwis (Chris Knox, Janet Frame, Michele Leggott, Mariana Isara), but with a wee few Americans to boot (Mr Robert Creeley, Jeffery McCaleb and Gerald Stern). It is always a privilege to be putting up poetry posters. I never have to mess with the bad when I’m putting up poetry posters. 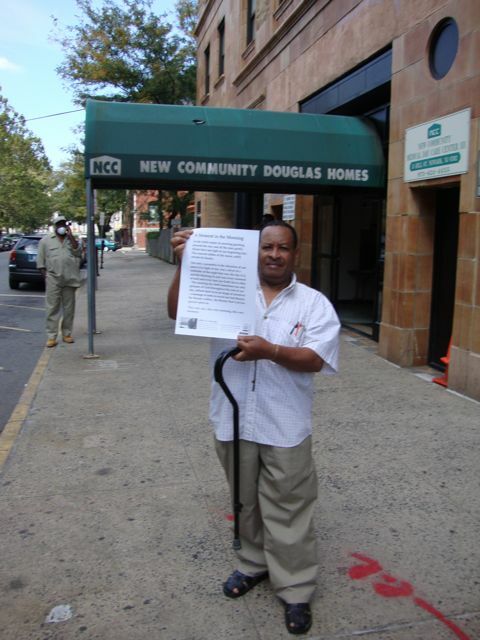 Newark is known as a city to be in the deep doo-doo with “boo-coo” social problems. Indeed, I saw more tape stating “Police Line – Don’t Cross” than I had ever seen in a single place in my life. And I’ve been to Russia. I don’t know if one dares to call it all a ‘class war’ anymore or even a ‘drug war,’ but there’s no doubt that some of these places are just plain worn out. They’ve already given. You can no longer get everything you want at Alice’s Restaurant. America is closed. The last orders have gone in and we await the verdict. The drive down I-95 to Newark isn’t promising at all with many closed strip malls and a fast-food joint every thirty feet. Americans don’t like to go far without constant supplies of food. I’d say that food provides comfort for harrowing times. When you don’t have any control, you can always eat. There’s a huge political system at war with itself here and it’s a very destructive and hungry monster. Underneath this system, people are, as always, good and usually trying to do the right thing. In New Zealand we might think of the old time ‘Kiwi Battler,’ well they’re the same in America too, only fatter. I think William Faulkner in his Nobel Prize acceptance speech in the early 1950s talked about people living in a constant state of fear. Well, that’s never changed and it has in fact been amped up for commercial gain. But we do talk about Phoenixes in this life and especially in America where people often reinvent themselves and quite rightly so. Cities are doing this too and I have in mind that the amount of pain that the USA is going through right now will lead to a much better country and perhaps more grounded in what is ‘real.’ That was the missing element for such a long time as the financial markets were hyped time and again and people correspondingly acted out wild and savage fantasies in strip malls. If you didn’t have it, you could buy it. Extra cheese was never a problem. Motivational artists, (George W. Bush? Bill Clinton?) drove the country on to extreme lengths and people were hurt. Well, I think people have had enough pain. Now there’s just the fear to be conquered. In musical terms (which I often think of), you can sometimes do a lot for a band when a key member leaves and the rest of the band pulls together. They find they don’t really need the hamburgers and the fancy hotels. They sometimes go back to playing the small rooms where everything comes from. They might play the Captain Cook in Dunedin and enjoy it. Well yes, poetry definitely belongs in the streets. That’s where it will do the most good. I would say that cities like Newark (and most cities are like Newark in one way or another) really need poetry and all forms of good expression. Janet Frame seems to suit the city, as does Chris Knox. Then, I have never been to a place that I have felt hasn’t been uplifted by a Robert Creeley or Jeffery McCaleb poem on a lamp-post. These are things of the heart and that’s what we need more of. We need simple things. We need the small rooms and lots of poetry. People (all kinds of people) need to be able to speak. The bible says something about that if we bring forth that which is inside us it will save us. If we don’t, it will destroy us. Well, it nearly has. Newark gave the world Philip Roth and Allen Ginsberg. For this alone we are grateful. Philip Roth’s new book, ‘Nemesis’ is released today. Last week Mark Zuckerberg (of ‘Facebook’ fame) gave the Newark school system one hundred million dollars more than his detractors have. They are giving the world something else entirely. Something we see a lot of these days as people rip each other to shreds. So I always have a lot of fun putting up poetry posters and talking to people about them. I really think that people are always looking for real ways to connect and then to tell their stories. We’ve heard what the bank and financial institutions have had to say, we’ve heard from the politicians (of all stripes), and we’ve heard all the spin that this sweet old world has got to offer. The media has chimed in a thousand million different and confusing ways. The only thing left is people genuinely expressing themselves and the arts (of all types) offer that very healthy outlet. You can’t beat poetry.